Did you know that the sense that is most strongly tied to memory is the sense of smell? To this day, freshly baked bread takes me back to my grandmother�s house and Sunday dinner. This would explain why we don�t experience taste and smell in our dreams. Most of the time, we don�t remember our dreams so it therefore makes sense that the sense of smell is absent from them. Because smells are so important, doesn�t it make a lot of sense that different smells can affect your mood? This is what aromatherapy is all about, and Aromatherapy Arbonne products not only affect your mood, but they treat your skin as well. I am going to review some of the products here. Awaken Sea Salt Scrub - Made with all natural ingredients like avocado and almond oils, the Awaken Sea Salt Scrub does just that. It clears away dead cells and awakens the healthy live cells underneath the surface. 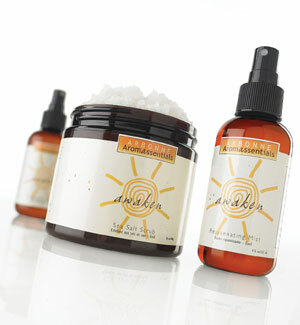 This is one of my favorite aromatherapy arbonne products. It really helps keep my legs and feet smooth. Awake Rejuvenating Body Mist - When used in conjunction with the Awaken Essential Oil Blend, the Awaken Rejuvenating Body Mist is sure to put you in a relaxed mood while it hydrates your skin. This amazing product is made from all natural products, such as clover, ginseng, and birch extracts. Awaken Bath and Shower Gel - Have you ever used a soap or shampoo that left your skin and hair feeling dry after use? The Awaken Bath and Shower Gel will clean your skin without giving it that dry, itchy after felling. It is made up of green tea oils, kukui, and parts of the orchid. Awaken Body Lotion - I think my favorite is the Awaken Body Lotion. It will leave you skin moisturized, protected, and feeling refreshed. You will love the smell of the ingredients, orchid, nettle, safflower, sunflower, and aloe extracts. It will put you in a good mood that lasts all day long. Reactivate Body Lotion - Sometimes you don�t want to feel relaxed; you want to feel ready to take on the day. The Reactivate Body Lotion will help you do just that with smells of lavender, horse chestnut, and green tea. Unwind Body Lotion - Or maybe you just want to relax with the Unwind Body Lotion. The flower extracts and sage oils in its makeup will relax you to the point of wanting to take a nap. Unwind Bath and Shower Gel - Wash away the stress with the Unwind bath and shower gel. It will clean the dirt off your skin, and keep it smooth and moist. The smell of the white oak and balm extracts, along with safflower oil, will get you in the mood for the evening. Please do not use this product in the morning unless you plan to take the day off. Arbonne Message Oil - I know my husband wants to run and hide when I come out of the bedroom with the bottle of this message oil. ha It is fantastic! It feels warm and it soaks into the skin instead of sitting on top of the skin. Making for a great message and great skin afterward. Ingredients: Hazel, pecan, corn, peanut and jojoba oils. It is great for all skin types. Whatever you need, be it rejuvenated, relaxed, or refreshed, Arbonne skin care Aromatherapy will have the right aromatherapy treatment for you. The large assortment of shower gels and body lotions will help you take the day on, take the day off, or just feel refreshed and relaxed.